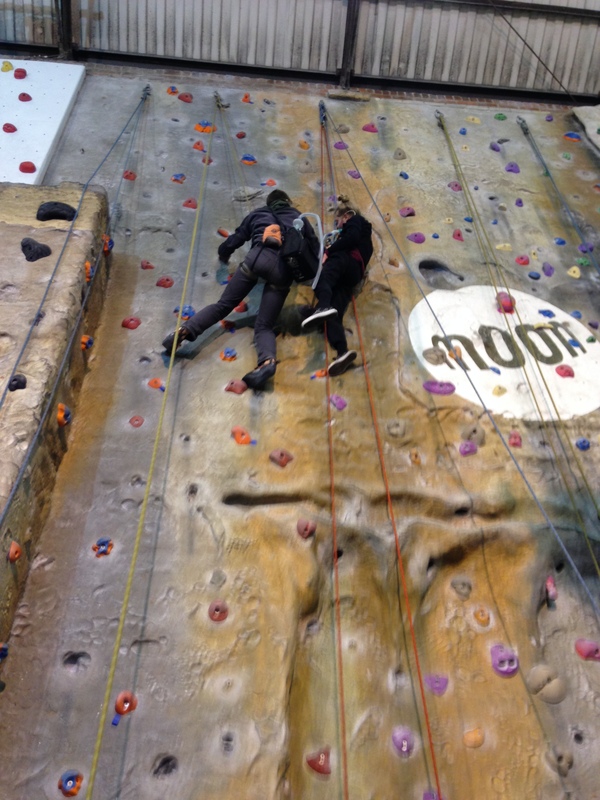 Third climb at The Foundry – Saturday 22nd March. High expectations or height expectations … from the start there is talk of topping. I’m thinking privately: is it wise? Wise to aim for the top and in not reaching it risk disappointment for Clare? 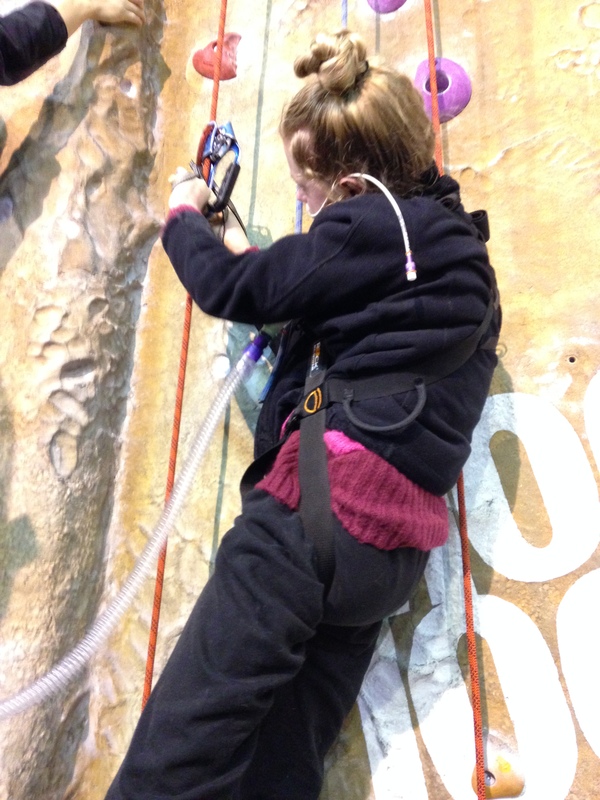 Safe to aim for the top, so high up, if mum and carer down below can’t see whether Clare is OK? We’re looking at the new equipment, and smiling. 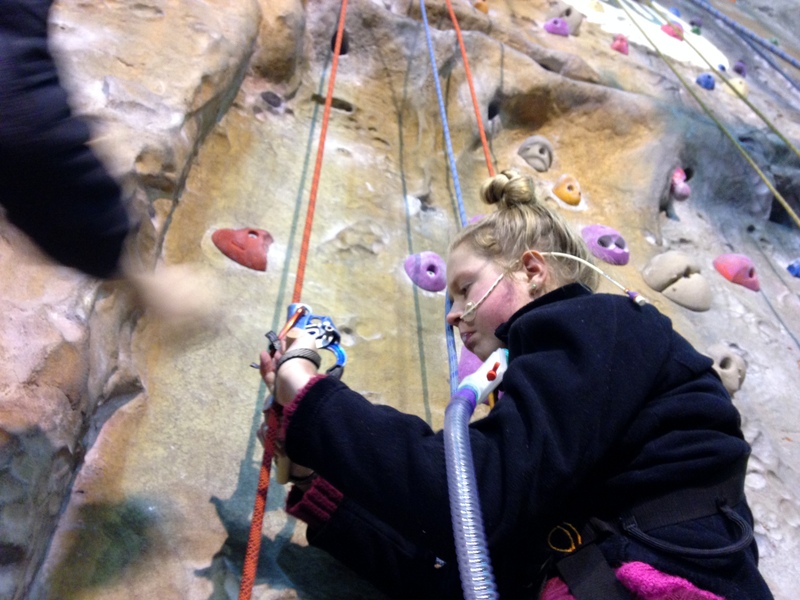 Clare is smiling because climbing is what she wants to do. Nick has revisited the bar that wedges through the jumar, and its wrist loops. I take a picture of new, improved item later on, held by Robin. We decide that henceforth it will be known as a “Whittaker”. Nick also has a “gri-gri”, which he spells for me. 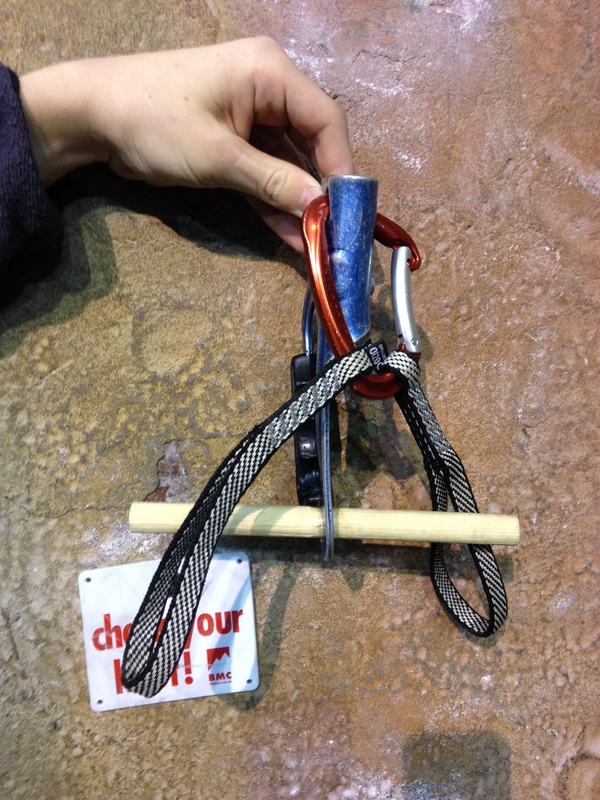 A simple, standard bit of kit which hopefully will stop his hands blistering on the belay rope. I don’t think Helen is using one – but Robin’s feet stick spider-like to the walls so Helen’s hands perhaps avoid much friction. My contribution for Robin is a thicker and padded strap for the ventilator. Robin has made a shoulder-slung ventilator look surprisingly easy, but it surely is a strain and we joke about his bruises and blisters. The Whittaker is a success and Clare can mostly keep her hands on the bar. 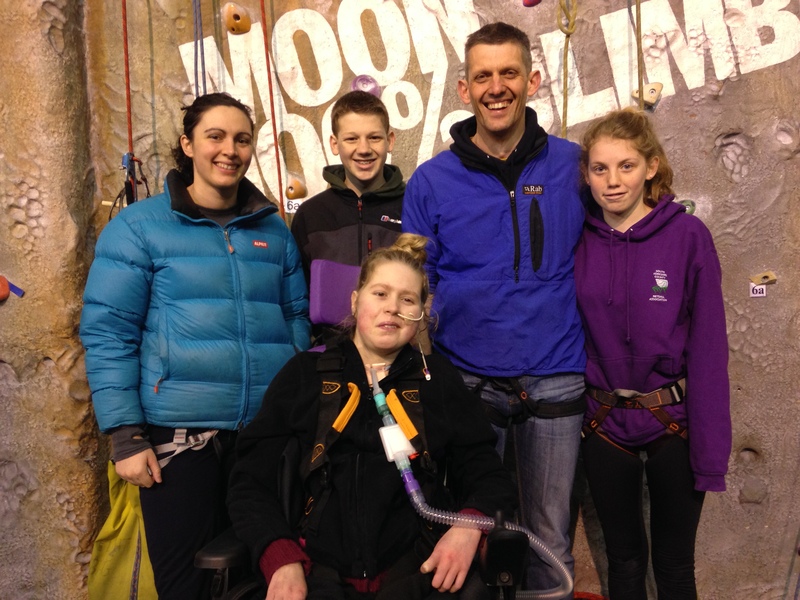 With help from Robin and Nick, Clare’s pulls lift her higher and higher… she is working hard, again and again …. The vent tubing drops off a couple of times. Down below we shout up to Robin, who retrieves the dangling tubing and pushes it back on. A lot of responsibility for Robin? – definitely, but actually the vent tubing is not hard to deal with. As Clare gets higher, Robin is checking that Clare wants to do “one more pull”. Clare nods yes. But then comes a time when I can see Clare is starting to look a little bit trembly. She should get down. I untie that rope, and Nick and Helen let Clare and Robin head downwards. A deep, sculpted groove runs across today’s climbing spot, and Clare’s foot looks like getting stuck … Helen and Nick shout advice to Robin, who clambers across to help the foot escape. Straight back down into the chair. Phew. Rest. Rest. Rest. As Clare makes her initial pulls on the jumar and leaves behind the support of my hands I can feel those triangular “trap” muscles working hard. Nick is pulling hard too, and Clare surges upwards, even faster than before. I’m not certain if Clare will call it a day before she’s exhausted. Before and after her injury she’s shown the kind of determination where need for success overrules well-being. One time, during the locked-in months, her chest ‘splinted’ and her oxygen levels dropped low as she put utmost effort into typing C L A R E on the eyegaze computer she’d been loaned. We are all checking (mainly via Robin) that Clare wants to continue. One surge at a time. Slightly above the level of the painted moon … getting close to the top.